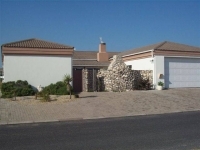 Beautiful, fully equipped self-catering home situated in the popular holiday town of Langebaan on the West Coast of the Western Cape. Available for long-term rental (approx.1yr) or short-term holiday rental from December onwards. 2 bedrooms accommodating 4 adults comfortably. Facilities include: DSTV (bring own smartcard). Indoor & Outdoor braai/barbeque To view more information on Langebaan and activities and things to do in the area, please visit www.ilovelangebaan.co.za. Bathroom details 1 full bathroom with shower, bath, basin & toilet. Bedrooms details 2 Bedrooms, each with a double bed. Living Areas Spacious open plan living area including a lounge and dining area.